#PCMACO - official conference hashtag. Follow, share and join the conversation. 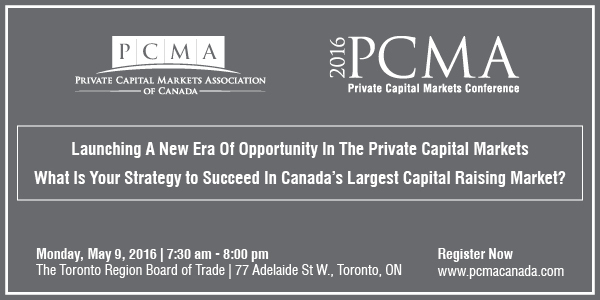 The Private Capital Markets Association of Canada (PCMA) is pleased to invite you to the 5th Annual PCMA Private Capital Markets Conference taking place on Monday, May 9th, 2016 at the Toronto Board of Trade. “Launching A New Era Of Opportunity In The Private Capital Markets. There are very few opportunities to bring together the unique issues of our private capital markets into a single forum; our goal as the PCMA is to provide access to the top industry leaders and regulators and bring forward the ideas and opportunities that will grow and transform the private capital markets. Please join us on May 9th to interact with leading experts on a range of topics dedicated to helping you grow your business, navigate complex regulatory issues and prepare for the private capital markets opportunities on the horizon. Review pictures from previous events HERE. As in past years, the conference will culminate with the presentation of the innovative 2016 PCMA Private Capital Markets Awards - the only national industry awards for private capital markets professionals, which recognize business leaders who help build a vibrant and successful private capital markets in Canada. Please nominate your transaction/financing today! You can find more details HERE. Entrepreneurs, exempt market dealers, private capital issuers and companies, legal, accounting, and compliance advisers, private equity and venture capital funds, investment advisers and regulators. Register early as last year the conference was sold out well in advance. The support of our Partners has made a significant difference in the private capital/exempt market industry from coast to coast. We offer our sincere appreciation for the leadership, vision and commitment of all our members and supporters. As a PCMA Partner, you will receive an exceptional value and will be able to reach key decision-makers in the private capital markets industry. If you are interested in becoming our Partner, please review our current opportunities HERE. Participants are eligible for 7.5 hours of continuing education credits from the Financial Planning Standards Council (FPSC) for attending the 2016 PCMA Private Capital Markets Conference.